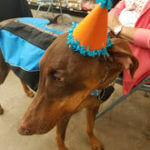 Ruffin’ Inn actively works with United Doberman Rescue and Canine Castaways of Minnesota, UDR, a 501C3, not for profit, foster home based animal rescue, founded in 2005, whose focused is the Doberman breed. Ruffin’ Inn supports all homeless animals and many other rescues when asked. 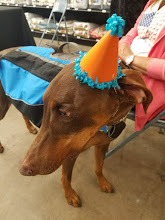 If you need to surrender a Doberman, or need help with your dog, feel free to contact UDR at 612-405-8522 for more information. 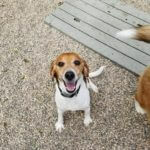 Check out the rescue website for more available dogs, some you may see playing at Ruffin’ Inn! 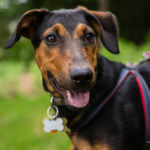 DORY-Available for adoption! Foster needed! 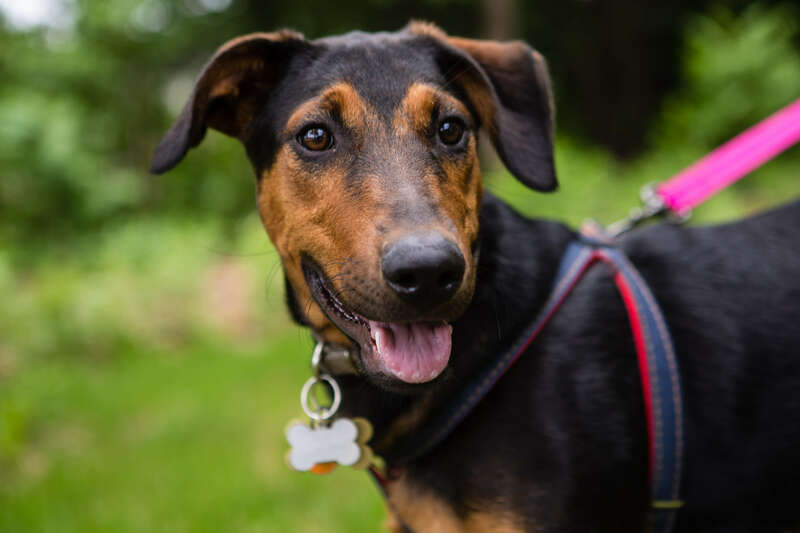 Dory is 1 years old and has attended formal obedience training in her previous home at a training center that people send their dogs away to, then they come home all trained. Because her people were older ( over 80 years old) her energy level was not a good fit for this couple. Dory loves to play!!!! She needs and active home with an equally active master. 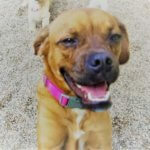 Dory loves other dogs and loves to attend daycare at the Lodge and she is a very happy and obedient girl! She has been around cats and would do well in a home with dog savvy cats. This lovely girl would love to find a forever home to call her own! Volunteer OR Foster-UDR is always looking for FOSTER HOMES to help the dogs that need temporary places to stay until they get adopted. UDR will provide food, some supplies, crates and pay for all needed vet care for your foster dog. You supply the love and structure until a permanent home is found through our adoption process. If you can’t foster consider donating some time by doing computer data entry, calling applicants or doing home visits to get adopters approved! Donate- You can still help without being actively involved by donating money to pay for vet bills, new or used dog and cat items you no longer use, crates, bedding, blankets, even unused medications can be used and are so appreciated by animals that have nothing! Feel free to drop off items at Ruffin’ Inn. We can provide a tax receipt, just ask! 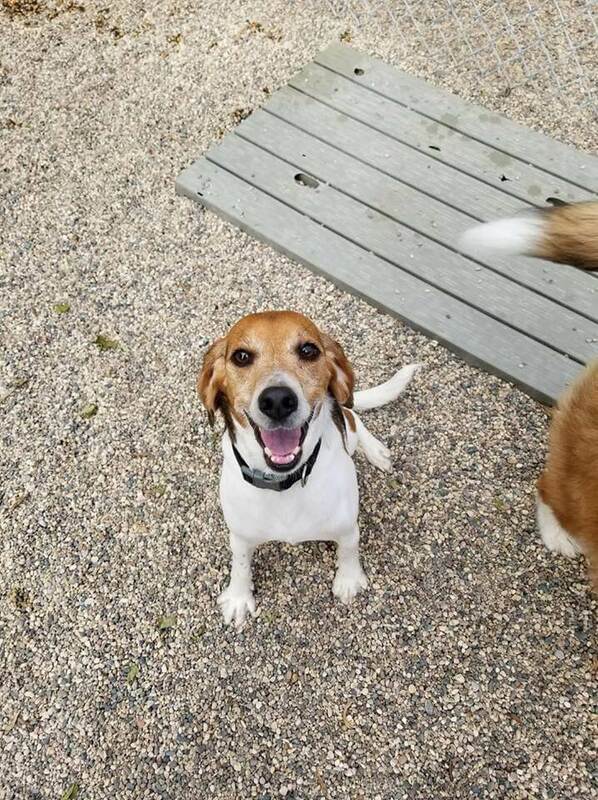 Adopt– UDR always has homeless dogs available for adoption. Other then fostering, the kindest thing you can do for these homeless animals is give them a forever home with you. *Please NOTE! While Ruffin’ Inn is NOT a shelter for UDR, on occasion, we help dogs from UDR and other rescues when asked. Ruffin’ Inn does NOT have animals for the public to view for adoption. Please call the UDR phone number for questions on any of UDR dogs! Ruffin’ Inn is strictly a animal boarding facility with paying guest, not a shelter!